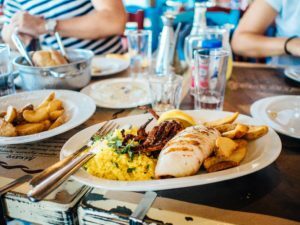 We know how important it is to find a place to eat out with the kids, so we have compiled a list with kid-friendly restaurants and cafes in the area. This section will grow – and if you have your own special finds to add, then please get in touch. We can only eat so much! Enjoy! Sprok is a beautiful and hip beach restaurant directly on the river Waal. Next to the restaurant children can play on the banks of the river. When the weather is nice a great place to be. Atlantis is a big all-you-can-eat restaurant in Arnhem south. Very child friendly and a big range of food, so everyone will find something tasty. Den Strooper is a pancake house with play corner right next to one of the entrances of the Park Veluwe, so you can drop by on your way or back from the walk – you will need to recharge. The kids play corner is also a great feature! The ABC Restaurant is a wonderful place to visit as a family and get the chance to enjoy an all-you-can-eat from a wide choice of international cuisines and actually sit down, as they have a play area for the kids. It gets very busy though so an early dinner could be the smarter choice. Happy Italy is a very child friendly Italian restaurant in the city center of Arnhem, close to the train station. At the restaurant you can find not only very special pizza creations but on the top floor there is an amazing indoor playground for children. Pancakes restaurants are very common in the Netherlands and children love it. Most of them are very child friendly and sometimes you can even find a playground at the restaurant area: https://www.hartelust.com and http://www.pannenkoekhuis.nl/pannekoekhuis-schaarsbergen-home/ are just some of many.